This unusual and interesting surname, recorded in the spellings of Peascod, Peasegod, Peasegood, Pescod, and Peskett, is of Anglo-Saxon origins. It is an occupational surname for a street seller of 'hot peascods'. 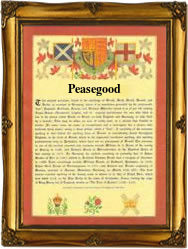 The name derives from the Olde English pre 7th Century "peose or pise", meaning the pea, and deriving from the Latin "pisa", with the Olde English "codd", meaning a bag; hence, a peascod or peapod. The Olde English term "pise" was a collective singular, from which the modern English vocabulary word "pea" is derived by folk etymology, the singular having been taken as a plural. The "Privy Purse Expenses of Elizabeth of York in 1502" records the following: "Item, to wif of William Greneweye for bringing a present of peesecoddes to the Quene, 11s". The development of the surname from this source includes John Pesecod of Northumberland in 1279, William Piscod of Sussex in 1327, and John Pasegude of Yorkshire in 1441. Godwin Pescod was recorded in Norwich in 1444, whilst on November 20th 1635, John, son of William and Elizabeth Pescod, was christened at St. Martin in the Fields, Westminster, London. In 1664 Katherine Peasgood married William Spencer at St James church, Clerkenwell, London, and on November 20th 1704, John Pescott was christened at St Andrews, Holborn, London. A Coat of Arms has the blazon of an ermines shield, on a gold chief, three black griffins segreant, the Crest being a silver griffin sejant, the dexter clay raised, beaked and membered gold. The first recorded spelling of the family name is shown to be that of Richard Pisecod, which was dated 1221, witness in the "Assize Court Rolls of Warwickshire", during the reign of King Henry 111, known as "The Frenchman", 1216 - 1272. Surnames became necessary when governments introduced personal taxation. In England this was known as Poll Tax. Throughout the centuries, surnames in every country have continued to "develop" often leading to astonishing variants of the original spelling.